So it put a smile on my face when this personalised bottle arrived at Fluffy HQ, to launch the Coca Cola ‘Share a Coke’ campaign. The brand is inviting people all over the country to share a coke with family and friends – and if you’re lucky, you could snap up your own personalised bottle, too. 150 of Ireland’s most popular names can be found on 500 ml bottles of Coca- Cola, Diet Coke and Coke Zero. (Not in Ireland? Similar campaigns are also happening elsewhere!) They’re accompanied by ‘You’ and ‘Me’ 330ml cans, and 2 litre bottles saying ‘Friends’ or ‘Family’. You’ll find them in stores now until the end of August. 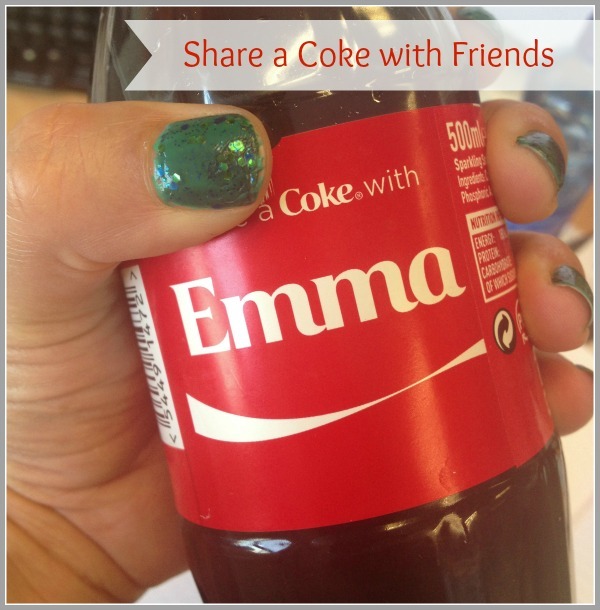 And if you can’t spot your name, visit www.shareacoke.ie to create a personalised digital can. If you fancy sharing a coke, I have two lovely special edition boxes, each containing two 500 ml ‘Friends’ bottles, to give away. This one is Ireland only and couldn’t be simpler – just tweet me @fluffyblog saying you’d love to #shareacoke, and leave a comment below! As always you must be a follower of this blog, via Bloglovin' or GFC, in order to win. I'll be picking the winner on Sunday. Good luck! Now I'm off to stockpile the 'Emma' bottles...! I'd loved to share a Coke but they never have my name on anything :'( story of my life! That is so cool! I want one with my name. HaHaHa I'm a Coke fanatic! I'd love to try this, unfortunately i'm not on twitter but have liked and shared!! Tweeted here: https://twitter.com/Shannairl/status/334704016858685440 - would love to find my name on a bottle, bet you I won't! Great marketing idea by Coca Cola, it's always exciting to find your name on something. Oh you must keep the bottle when you've finished the Coke!! I love the idea of a personalised bottle!! Technically entering this for the boy. He's a cokeaholic (good coke) and collects bottles. Already has the bottle and can in his name I know he would just love a limited edition bottle. Other lads gets excited about football my lad gets excited about bottles! I am a coca cola lovers... not the light one, the original one..
Good idea the label with yr name..
Today in town they were giving out free coke bottles and the slogan said "let's share a meal together". Nice.